Gold and silver prices are surging. Gold is already up almost 2% for the week — while silver has posted gains of nearly 3%. Although it's still very early, gold and silver are far outperforming the Dow and other major indexes for the year. Gold and silver prices have both tacked on nearly 6% since the end of 2015, while the Dow, NASDAQ, and S&P 500 are in the red. The rally in precious metals comes as worries over the Chinese economy put pressure on Asian equities and stronger doubts over another interest rate hike in March arise. And gold bulls are rejoicing. Concerns that capital outflows will continue to increase as China's economy cools off and the yuan experiences further devaluation have pushed the Chinese market to its lowest level in over a year. 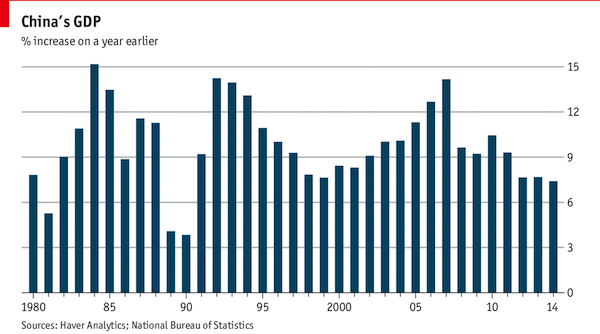 This year, growth of China's GDP is expected to slow to 6.5% — its slowest growth since 1990! Meanwhile, capital outflow from China has nearly hit epic proportions. In 2015, estimates suggest that a record $1 trillion left the country — over seven times higher than 2014. Fears of slowing economic growth and staggering capital outflow have significantly boosted the demand for gold and silver as safe havens in China across the retail, investment, and official sectors. The World Gold Council reported a 70% increase in gold bars and coins in China during the third quarter of 2015, compared to the previous year. The organization expects to see record demand for physical gold in China after all the beans are counted. Meanwhile, the People’s Bank of China has been on what the World Gold Councils calls a “buying spree” for gold. Back in July, the country announced that its gold reserves had increased by 50% since it last reported its holdings in 2009. Since then, the PBOC has been adding between 14 tonnes and 19 tonnes of gold to its foreign reserves every month. Now, with nearly 1,800 metric tonnes of gold, China is the sixth-largest owner of the yellow metal. And there are no indications that the central bank is through buying gold yet. The surge of Chinese interest in gold bodes extremely well for the yellow metal going forward. In the near term, however, it's likely that gold prices will mostly be driven by speculation over the U.S. Federal Reserve's next rate decision. The gold market has been particularly anxious this week as the U.S. Federal Reserve began its two-day January meeting yesterday, which is expected to give clues about the next rate decision. With concerns over China's slowing economic growth and other credit risk around the world, it's likely that the Fed would be slow to hike borrowing rates. According to data compiled by Bloomberg, analysts now predict there is a 22% chance the Fed will hike interest rates at its next meeting in March. That's down from 51% from just the beginning of the year. The FOMC will release a statement later today after its meeting. We'll keep you up to date on everything. Rising gold and silver prices are heavily contributing to a price surge in shares of mineral and mining stocks. Canadian mining companies in particular saw added gains as the loonie tacked on its biggest gain last week in over four years and the British Columbia government announced a new plan that will allow mining firms to defer part of their power costs until commodity prices bounce back. I remain very bullish on precious metals and now expect to see gold prices break through $1,200 within the next several weeks. To best leverage rising gold and silver prices, keep reading Energy and Capital for several new precious metal stocks that I and the other guys here have been watching and that we expect to present to you within the next few days. As the official silver bullion coin series of Canada, The Canadian Silver Maple Leaf is one of the most widely-recognized and sought after bullion coins in the world. Energy and Capital editor Luke Burgess shows investor three easy steps to put gold, silver, and other precious metals into an IRA. Is the Canadian Dollar Headed for a Turnaround? Has the multi-year, record losing streak for the Canadian dollar finally snapped? Energy and Capital editor Luke Burgess takes a look at the loonie's recent rally. Energy and Capital editor Keith Kohl explains why investors are rushing to find value while markets around the world are at a loss.